The other day on Twitter, fellow Kotaku writer Kate Cox mentioned she had just finished Xenogears, Square's classic PlayStation role-playing game. Since Xenogears is one of my favorite games, a classic up there with the best RPGs ever, I bugged her roughly 19283493849284924 times to come chat about her experiences for Random Encounters. Eventually she said yes. 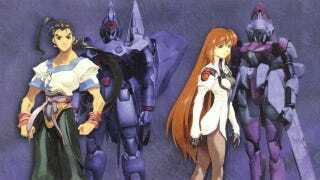 So here we are, talking giant robots, schizophrenic protagonists, and all the other little things that Xenogears does best. And the ones it doesn't do well at all. Warning: Major spoilers for Xenogears follow. Jason: Hey Kate, and welcome to Random Encounters, aka the little corner of Kotaku where I hang out and talk about JRPGs a lot. Today we're going to discuss Xenogears, one of my favorite games ever and a game that you have just finished, correct? Kate: Correct! I never had a PlayStation around until 2008, but my spouse just got all nostalgic for Xenogears when Xenoblade Chronicles came out last month, so we just played it through. Never saw it before! Jason: So... what'd you think? Kate: Some of it was really brilliant. Some was overwrought. Some was really ahead of its time. And some was just soooooo... JRPG. How many random map battles can one game even hold?! Jason: Yeah, random map battles can feel a little obsolete. Especially when you're trying to pull off a tricky jump in the Babel Tower and suddenly you get into a random battle while floating in mid-air. It's just a tiny bit silly. So let's start with the good stuff. What'd you think was brilliant? Kate: I loved some of the visuals. The whole Solaris council, the floating TV-head-sphere thing? That was gorgeous. And the music, throughout. I loved the Ethos music — I'm still humming it, ages after finishing. And even though I was pretty cynical at first, I have to admit that in the end, the Fei and Elly story really got me. Jason: A love story carried on across generations. How could you not dig that? I always lose it at the beginning of disc 2, when Fei and Elly are both sitting in those chairs and staring at the screen and their monologues sorta echo one another. And then that SONG. The music box song. So good. Kate: Right, but disc 2 — what is UP with that? I was forewarned that I'd see a "drastic change in tone" when we swapped discs but even then I can't quite believe what happened there. It's like a totally different game. There are some really cool storytelling techniques in it, to be sure. The chairs and the screens and the almost literal fourth-wall placement and flashbacks and such — very nifty stuff. But completely, utterly out of bounds with the first disc. And set up in such a way that most of the "good bits" happen off screen. It's like the worst of the "Tolkien problem," where characters show up and say, "So about that really nifty thing: it happened while you were unconscious or somewhere else or whatever, and is over now." The second disc does that tons and a video game... really shouldn't. Jason: Yeah, a lot of people didn't like that sudden pace-shift at all. I gather you're one of them. But to be honest, I found it refreshing. By that point in the game—right after we'd survived the arduous trek through Solaris and some crazy plot twists—I was ready for a breather. I didn't feel like slogging through more dungeons. I just wanted to see how the story would unfold, and that's what I got. But as much as I like to believe it was a deliberate decision, the truth is that they just straight-up ran out of money. They had to cut out a lot of things, like Elly's Omnigear. Fun fact: Ramsus was originally going to be a playable character. Kate: I probably would have left Ramsus out of my party with the stompy pink fluffball thing. Kate: I tried Chrono Cross just this past year, too — pink fluffy characters (that one's Poshul, right?) are a JRPG trope that I do not get along well with, hehe. Actually though I really wish they'd thought of the style changes before they ran out of money. If they'd mixed that in with the "standard" play on disc one, the whole game could have been really, really innovative. I really wish they'd thought of the style changes before they ran out of money. Kate: Yeah, that's the other thing, I wish they'd streamlined the story a bit. Some detours, like the whole arena and sewers bit in Kislev, just... didn't add anything. I felt badly for Rico, actually. He was just so utterly tangential and pointless to everything. All your other party members fit into the overall political story somewhere or other, even if their fights (like Bart's) turned out to be small potatoes or a red herring compared to the massive scale by the end. But all that Kislev nonsense just... didn't add anything, either emotionally or thematically. And by the time the end is getting short shrift, it's hard not to wish that they'd cut segments like the sewer murders and put the money into the "A" story instead. Jason: Can't say I disagree with you on the whole. Did you talk to that one kid in the orphanage, though? There's a whole subtle subplot if you do: basically, that mutant you killed in the sewers was a harmless mutated version of this kid's dad. And you murdered him. For no reason. It's a bit of a creepy moment (sort of like when you discover that you just ate PEOPLE). And anyone who doesn't know what a soylent plant does... well. I appreciate what they were doing , everywhere, but I admit to liking it more with the obscure names that I had to look up and think about. A soylent plant that SURPRISED EVERYONE OMG just made me think that Elly should really rent more movies. Jason: Japanese RPGs are certainly not known for their subtlety. There's a crazy huge amount of potential in Xenogears. And I don't think a remake would fix it, because modern graphics wouldn't really help. I think I found it frustrating that every time I really wanted to get over my cynicism and fall for the game, some utterly strange decision stopped me short. Jason: Hammy names aside, don't you think the whole Fei/Id/Coward thing was interesting? Here we have this protagonist who seems like your stereotypical amnesiac hero, destined to save the world... and it turns out he's actually a repressed schizophrenic with a monster in his brain. You didn't see many twists like that back in 1998. Kate: Yeah, Fei's story did intrigue me. I kept developing all these theories through disc 1, based on flashbacks and clues (like the Sophia painting in Nisan), but I was fairly far off the mark, haha. I figured from early "Fei as kid with blood on him and swinging cross" flashbacks that there were some kind of crazy goings-on in his history but I was surprised where they actually went with that. And they handled dissociative identities a bit better than games and entertainment often do. Jason: They are handled really well, I think. You have all these different psychological issues coming into play—for Freud's sake, Fei's mother almost killed him—and the game never shoves them down your throat (even while it is shoving other things down your throat, like -Every- -Proper- -Noun- -Looking- -Like- -This-). You have this love story between Fei and Elly that's complicated by this literal incarnation of female evil, Miang, who just takes women over and fucks with their heads. And the story of Fei and Elly just seems destined to repeat over and over again, for generations. It's happened before and it'll happen again, over and over, even once the game has reached its conclusion. There are a lot of powerful themes and ideas at play here. Kate: Yeah. And those were the bits that pulled me in. I particularly loved the scenes you get to see with Fei and Elly through the ages—as different people, in different societies. For whatever reason, the one that lingers the most clearly is when they were at dinner in a fancy restaurant, with a wide city view. Actually, I know why it sticks with me. He was in a suit— a normal business suit, with a tie—and it was so... mundane. That connected my world to the game's world in a way I didn't expect, and that felt deeply meaningful. It made me think of mythologies I've encountered, or novels and short stories I've read, all on the idea of sort of... eternal connections and cycles. Incredibly ambitious. Jason: So to switch gears a little bit, let's talk about the gameplay. Particularly the combat, since that's what you spend most of your time doing when you're not reading. Did you have any favorite boss battles or fights? Kate: Mmm, not really. That's one of the advantages of tag-teaming a game with a partner, haha — anything I didn't want to deal with was his problem. Including most of the fights. ;) It's also, now, been a couple of weeks and a lot of the combat is starting to blend together, to be honest. The things I mostly remember are moments around fights — every time Grahf shows up and offers power, or the sheer number of times Ramsus sticks his face in, or wishing I could deal with the whole squad of Elements once and for all, haha. I don't tend to get sucked in by the combat in JRPGs. Actually, it's worth mentioning: I don't, as a rule, get sucked in by JRPGs at all, and that Xenogears held my attention makes it an exception! It's pretty rare for me to play one start to finish. Jason: What did you not like about the combat in Xenogears, then? Kate: Mostly it was fine, as turn-based combat goes. And most of what I didn't like, I have to admit, are artifacts of its time. Some of the animations for powers were amazingly ludicrous though, hehe. What's the one where it looks like you're exploding a whole moon? Kate: Well, yeah. I mean. Giant robots! What's not to enjoy? I did kind of wish Elly's wasn't pink. And didn't boff people on the head with a wand that made hearts. That's perhaps the least impressive thing you can do with a giant robot. GIANT. ROBOT. Here you have this badass, fearless general who has her own platoon and is totally gifted, and her robot is a giant Barbie doll. Jason: Silly, right? Here you have this badass, fearless general who has her own platoon and is totally gifted, and her robot is a giant Barbie doll. It's like they didn't think they could get away with a strong female character unless they shoved in SOMETHING stereotypical. Kate: That was a pretty big disconnect. Aside from that, Elly's actually a pretty serious badass. Commanding a unit of idiot macho-men and everything! Jason: So you say you played with your husband, right? Just how much of the game did you actually play and how much did you watch? Kate: Hmm. That's kind of a hard question actually, because so much of what I think of as gameplay in Xenogears is watching, you know? It's going through long conversations, or wandering around a small location (like any iteration of the Ygddrassil, or the Thames) talking to people. Most of the combat play was him. Jason: But it's the wandering around that makes you feel more invested in the world, I think. The act of using your joystick to move a character through dungeons and ships, while sometimes boring and tedious, is also a tactile sensation that absorbs you into the screen. While I hate to use buzzwords, the word "immersion" fits best here. Fighting, too. Struggling through boss battles makes story scenes feel like a reward, like you've earned them, like Fei and Elly deserve answers after all they've been through. So I wonder if your over-the-shoulder perspective diminished your experience of the game. Kate: Maybe, and it might have. I think part of it also is, sadly, just not having the time properly to sink my teeth into a hundred-hour game in eight-hour chunks these days. Stupid adult responsibilities! We mostly had short chunks of time to play in, from roughly 8:00-10:30 pm on weeknights, give or take. I think that's part of the reason I tend to play newer games these days; they break up better, as a general rule, into those discrete chunks of time. It's why I've had trouble getting into Chrono Cross, too — by the time I feel like I'm really settled into a gameplay session, it's time to put it away. I wish, when playing older games, that I had the same kind of time I did in the 90s, haha. Jason: That's what weekend marathons are for! But, yeah. How long did it take you guys to get through Xenogears? Jason: Oh, that's not bad at all. So you can fit in about... 12 JRPGs a year. Jason: Well... no. Any final thoughts or words on Xenogears before we wrap things up? Kate: On the whole, I can really see why it's a sentimental favorite for so many folks, and I kind of wish I'd come to it earlier in life with more time on my hands. It reaches very, very high and often falls incredibly short, but the attempts are kind of glorious. When it's good, it's exceptional. There are concepts—not just ideas, but the way they're communicated visually—in there that are just astonishingly clever. I'd love to live in a parallel universe where they had all the time and money in the world to flesh out the back half and really unify the whole thing. And when it falls flat, at least it's not because they don't give a damn. Clearly, they did. It's just, the higher you reach, the farther you can fall.